The intent of the Chumash Heritage National Marine Sanctuary (CHNMS) is to work with the harbors and fishers to preserve their historical connections and economic productivity. Therefore, the CHNMS will not add additional regulations to either harbors or commercial and recreational fishing. The CHNMS proposal includes statements regarding the important issues of maintaining harbors and dredging, and commercial and recreational fishing. After two decades, the National Oceanic and Atmospheric Administration (NOAA) invites coastal and Great Lakes communities to nominate their most treasured places for consideration as national marine sanctuaries. Residents of the California Central Coast have waited twenty years to be able to once again nominate their treasured nearshore coastal and offshore waters. Many individuals and groups have been hard at work over the last few years to reach this point to nominate a national marine sanctuary newly named, The Chumash Heritage National Marine Sanctuary. The concept of sustainability, while considered a lofty and progressive ideal within the wider philosophy of environmental protection, has a major flaw. Given the actual political process with its gives and takes among the variety of vested interests, the bench mark for sustaining a particular area at its current level is where political compromise begins. That is to say, the variables required to actually sustain a system become unreachable. Thus, the very attempt to work for sustaining the planet at its current state actually maintains the downward spiral. The proposed Chumash Heritage National Marine Sanctuary (CHNMS) is located along the pristine south Central California coastline, from Gaviota Creek to the south to Santa Rosa Creek in Cambria to the north. The western boundary of the CHNMS would be west of the submerged Santa Lucia Bank along the Santa Lucia Escarpment. The eastern boundary would be the mean high tide line along the coastline. These pristine coastal waters are between the Channel Islands National Marine Sanctuary (CINMS) and the Monterey Bay National Marine Sanctuary (MBNMS). 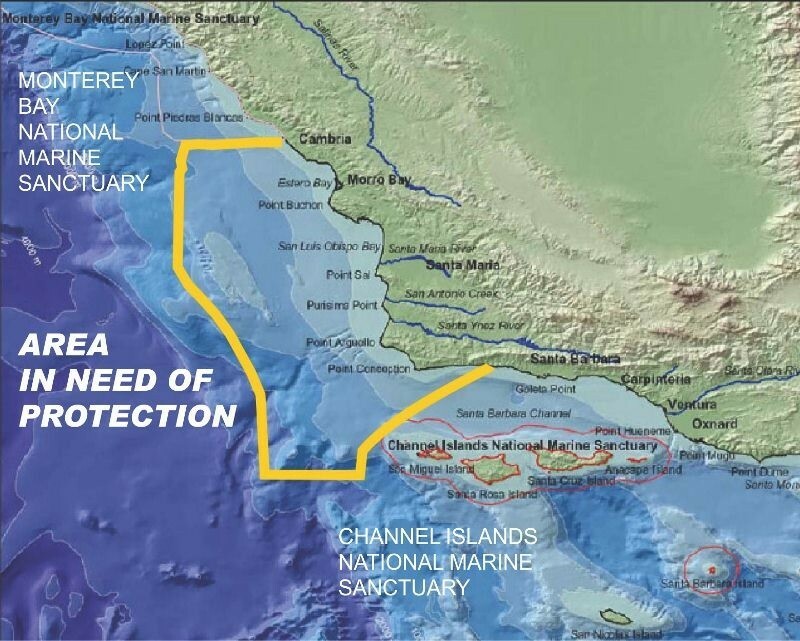 There are seven nationally and internationally important core areas within this proposed sanctuary that were originally identified in the 1990 proposal to become the Central Coast National Marine Sanctuary; however, the proposal died because of Congressional inaction. Greenspace-the Cambria Land Trust has joined other local groups in their support of the Chumash Heritage National Marine Sanctuary Proposal, and will host a Sanctuary presentation on June 4, 2014 at 6:30 pm at Rabobank’s Community Room in Cambria. The expansion of the Gulf of the Farallones and the Cordell Bank National Marine Sanctuaries was announced by the National Oceanic and Atmospheric Administration (NOAA) in an April 14, 2014 press release. NOAA is accepting public comments through June 30, 2014..
Support for the designation of the Chumash Heritage National Marine Sanctuary is gaining both local and statewide support to fill the gap with sanctuary protection between the Channel Islands and the Monterey Bay National Marine Sanctuaries. The Northern Chumash Tribal Council (NCTC), in collaboration with local, state, and national grassroots organizations is proposing the nomination of the California Central Coast Chumash Heritage National Marine Sanctuary.